The Polycom RMX 2000 Collaboration Server delivers high performance multiparty video, voice & content across your organisation, connecting multiple employees and partners wherever they are located, and on whatever device they choose. Organisations was their employees to be able to share their next great idea, face-to-face, wherever they are located, with whatever device, whenever they choose. The Polycom RealPresence Collaboration Server Series offer Software MCU’s that enable multiparty video, voice & content collaboration that connects the most people, at the highest quality but the lowest cost. The RMX 2000 is the middle range collaboration server, with twice the capacity of the RMX 1500 and half the capacity of the RMX 4000. The unique, innovative architecture of Polycom Collaboration Servers reduces costs and complexity. Only the Collaboration Server provides support for AVC and SVC protocols without expensive gateways, extra boxes or added risk. Based on open-standards, the Collaboration Server series integrates with hundreds of business, Unified Communications and social networking applications and protocols to make it simple to meet with others over video. Connect customers, clients & colleagues without expensive gateways. Collaboration Server breaks down barriers to video collaboration with broad support for existing and emerging standards, protocols, applications, devices and interoperability between unified communications (UC) environments. Only Collaboration Server platform solutions provide native integration with leading UC applications and support for IP, H.323/SIP, PSTN and ISDN, AVC and SVC, all within a single conference platform. Experience 3x capacity increase with a simple software download, lower operating expenses with up to 50% less bandwidth utilization and help enable more people on more calls through dynamic resource allocation. Leverage the power of Polycom Virtualization Management Solutions for reliable, extreme scalability with 100 percent auto-failover. Remove the barriers to interoperability with broad support for existing and emerging standards, applications, protocols and devices for seamless worldwide collaboration. The Polycom RMX 2000 real-time media conferencing platform leverages IP to simplify the delivery and management of multipoint video and unified (video, voice, content) conferencing services within enterprise and service provider IP networks. The RMX 2000 real-time media conferencing platform is based on the Advanced Telecommunications Computing Architecture (AdvancedTCA) for the optimal delivery of crisp, sharp video, audio, and multimedia content. This standards-based platform, created specifically for the delivery of advanced communications, ensures superior performance, product reliability, and manageability. The RMX 2000 conferencing platform incorporates a modular, IMS-ready design to provide maximum deployment flexibility and scalability. Easy to set up, easy to use, and a powerful tool for collaboration, the RMX 2000 real-time media conferencing platform provides intuitive, high-quality conferencing to end users, and unparalleled flexibility and control to administrators. Its straightforward user and administrator interfaces enable consistent, in-person communications experiences without cumbersome technology roadblocks, thereby increasing productivity and speeding conferencing adoption. The superior engineering and design principles of the RMX 2000 conferencing platform combine to provide the perfect balance of conferencing power, control, and ease-of-use. 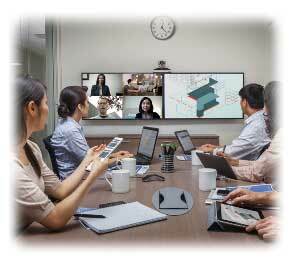 Support for a range of video resolutions, flawless interchanges with high-quality audio, and expert QoS control serve to recreate in-person meetings. Organizations benefit from improved communication, increased collaboration, and faster decisionmaking, all with the goal of enabling them to meet the challenges—and seize the opportunities—of today’s interconnected world. The RMX 2000 real-time media conferencing platform is the result of Polycom’s 15-year legacy of developing and leading the conferencing and collaboration market. It is a centerpiece of Polycom’s multi-pronged collaboration solution enabling seamless and natural interactions across endpoints and geographies.